Since 2005 we've represented mPower in Northern California and Northern Nevada. They are a leading manufacturer of Modular #Workholding systems for #CNC Milling #Mfg equipment, headquartered in Erie, PA.
mPower is the product development division of Modern Industries a diversified, multi-division corporation founded in 1946. As a manufacturing operation that faces global competition, they fully understand that the need work to faster, smarter and at a lower cost is the key to either success of failure in today’s competitive marketplace. 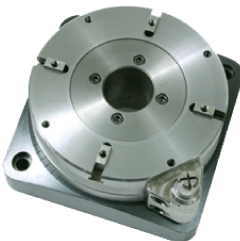 This is the basis of the entire workholding system. The mPower line offers you three receiver systems that enable you to easily create a fixturing system to best meet your specific machining needs. Standard Face Mount Design: This receiver is interchangeable with competitive face mount designs produced for “blind hole” applications. Compact Face Mount Design: Occupies a small footprint that optimizes sub-plate space, is easier to install and less expensive than standard face mount receivers. Back Mount Design: Provides a retrofit option for users of competing systems (like Ball Lock). These receivers enable you to take advantage of the speed, precision and easy installation which the SpeedLoc system uniquely offers without the need to purchase new sub-plates. The ModLoc modular tooling column system is engineered as an alternative to traditional cast and fabricated columns. They are designed to be rigid and strong, yet substantially lighter and highly adaptable. These columns are quick and easy to assemble and offer an open architecture, which is ideal for applications using hydraulic, pneumatic, or electrical control systems. The ModLoc modular tooling columns are designed exclusively for use with the SpeedLoc precision locator/fastener system, delivering dramatically improved throughput and reduced operating costs. ModLoc represents a whole new thinking in modular tooling column construction and design. Now you can handle fixture changeouts almost on the fly without missing barely a moment of production time. Designed exclusively for use with their revolutionary SpeedLoc™ precision locator/fastener system, ModLoc Tooling Columns deliver dramatically improved throughput and reduced operating costs. "One of the problems we see often (but not many people ask us about) is the process of actually loading a new fixture on the side of a tombstone in a horizontal CNC milling machine. Hoisting up the fixture and aligning dowel pins can become quite a chore and really increase set-up time and changeover time on the machine. And we all know that time is money."